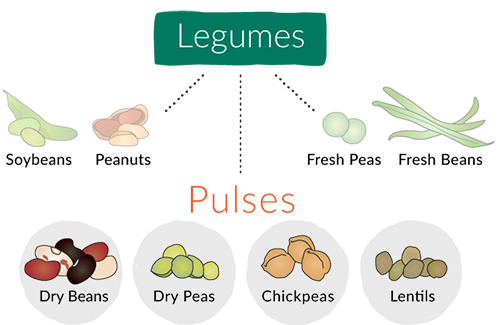 The dry, edible seeds of plants in the legume family, pulses are a category of superfoods that includes chickpeas, lentils, dry peas and beans. Pulses are an excellent source of protein, fiber and other key nutrients. There are thousands of ways to enjoy pulses, from the main course to soups, salads, dips and more! Pulses are one of the most cost-effective proteins around, at approximately 10 cents per serving. Pulse crops are water efficient, drought tolerant and frost hardy, and have a low carbon footprint. Pulse vs. Legume – What’s the Difference? Pulses are part of the legume family (any plants that grow in pods), but the term “pulse” refers only to the dry edible seed within the pod. Beans, lentils, chickpeas and split peas are the most common types of pulses. Pulses are special because they have distinct health benefits apart from other legumes. Unlike legumes like peanuts and soy, for example, pulses are low in fat and very high in protein and fiber. In addition to being good for you, pulses are also good for the Earth! Pulses are nitrogen-fixing crops, which means they can convert nitrogen in the air into a plant available nutrient. Pulses can reduce the need for nitrogen fertilizers, ultimately improving the environmental sustainability of annual cropping systems.